I searched internet content extensively and have finally created these notes that helped me get 85 points in PTE in my very first attempt. 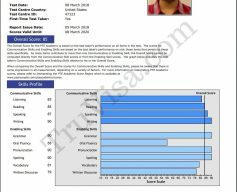 IELTS vs PTE? – My opinion on which one is easier to score maximum points for Australia’s skilled migration after giving IELTS twice (and failing to score more than 7 in all) and PTE once (proof above). 79+ PTE score gets you 20 points in Australia’s skill based Permanent residency application. I have embedded these videos here after watching them carefully and analyzing the content quality. You do not need to go anywhere else if you just watch them and learn the tricks (and cheat sheets) mentioned. If you just go through them, you will be able to score 79+ in each PTE academic module like reading, listening, writing and speaking. NOTE: CONTENT IS LESS IMPORTANT THAN HOW TO SAY IT. If no idea about what is shown, just read the words from the image and keep speaking. Key features (use 20 sec) – Just KEEP it SIMPLE. Describe the MAX/Min to maintain fluency and time limit. Keep the sentence going on. Don’t re-start sentence. Read words from the image. DON’T worry even if you say the wrong conclusion. It does not matter. Don’t STOP and don’t restart sentence. Listen to phrases. Divide it into 3-4 phrases. Repeat with intonation (raise voice at important words, lower voice at end of sentence) and meaning. Take notes. Note keywords. Get idea about the whole topic. Just use the sentences in BOLD as it is and then the words from what you heard. 50-70 words, 10 minute TOTAL time. You get about 8-9 minute for writing after listening to lecture. Similar to Re-tell lecture except that you have to write here than speaking. Try to write between 65-70 words to get maximum marks on content. Take notes and UNDERSTAND the dictation/ spoken lecture. Multiple sentences are allowed. Next step is to further sub-divide the essay sections into each sentence as shown in the image. Watch the video above for excellent explanation. This is screen shot from Jay’s E2 language Essay video. All thanks to e2language.com for providing valuable tips for PTE english exam online for FREE. I did not enroll in any of their paid programs. Just their video tutorials and mock-up tests online on YouTube channel are good enough. His methods for cracking each type of PTE question are just un-beatable. It can’t go wrong if you follow it by heart. I scored 80 in my PTE. All because of this article. Thank you! Congratulations. Thanks for sharing your result.